Milk Not Jails is fighting to end mass incarceration and is fighting for a more livable world. In that world, urban and rural New Yorkers work together to build a sustainable economy where once imprisoned people are employed and once struggling farms flourish. That is why we are part of the Peoples Climate March. Mass incarceration reinforces environmental racism. In New York City today, Blacks and Latin@s make up 86% of arrests, confrontations which have recently escalated to police beating a young Latino man, and murdering an unarmed Black man. Meanwhile, in the South Bronx, Harlem, Bushwick, and South Brooklyn, people are twice as likely to die from air pollution, yet Mayor DeBlasio has made it a priority to arrest people of color just for walking down the street. We must create a world where everyone can march in the streets for climate justice. New Yorkers are bound together by food and criminal injustice. When New Yorkers are arrested in food desert neighborhoods in Brooklyn, they are sent to prison in counties like St. Lawrence, Franklin and Clinton, which according to the USDA have their own rural food deserts. When New Yorkers in state universities eat the cheapest food available on the market, they’re getting same food as New Yorkers in state prison. Because these issues are interconnected, so must our struggle to create solutions to food and criminal injustice. To change everything we need everyone. We need to reform parole so all eligible people in prison can return to their communities to parent, mentor, and organize. We need to end Dean Foods’ dairy monopoly, so farmers can focus on defending farmland from development. To create climate justice we need to create a movement that sees all life as valuable and all injustice as an obstacle. Help us make that a reality this Sunday, September 21st at 10:30 am in the People not Prisons contingent meeting in front of the Natural History Museum on Central Park West. See you in the streets. Milk Not Jails’ newest member, Stephen Pendarvis, after a long day on the road. This week, Milk Not Jails welcomed Stephen Pendarvis into our worker- and farmer-owned cooperative business. 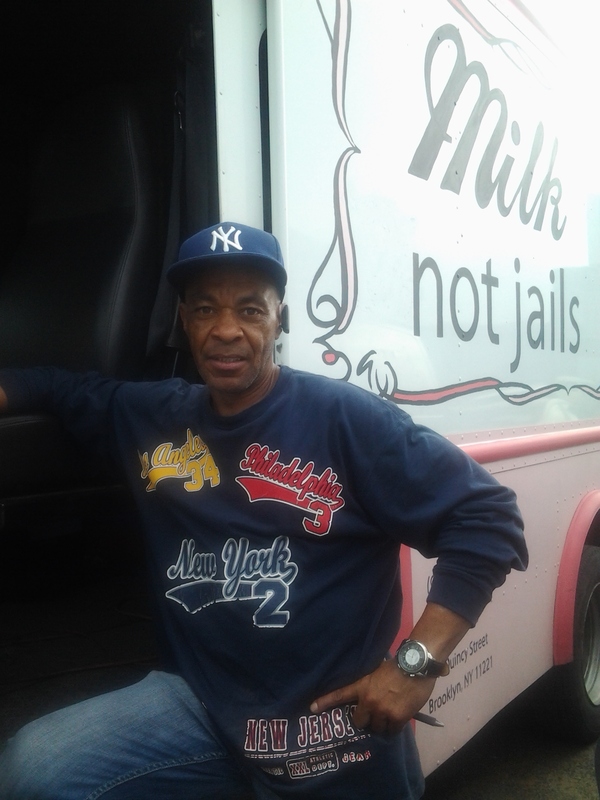 Stephen’s main responsibility at Milk Not Jail is to drive our truck throughout the five boroughs, making deliveries to a store near you and mobilizing people for change on the route! With a degree in Business Administration he’ll also be training us all in business development, so that we can make our social enterprise sustainable. Be sure to introduce yourself to him out on the streets. And read below a quick interview we did with Stephen will on the road yesterday. Q: Stephen, tell us a little about yourself. A. I was born and raised in Brooklyn. I live in Brownsville right now, but I’m a Flatbush man. I have two children, 1 15-year old daughter and a 6-year old son. I spent probably too much time on the weekends at Chuck E. Cheese with my son. Q: You have a business degree. How does that prepare you to be a cooperative owner here? A: I went to college down in South Carolina. I actually thought I’d be an English major or study journalism, because I love to play with language and I’ve always been told I’m a good writer. But my mother pushed me into Business, saying it was more practical. To tell you the truth, I haven’t had the opportunity to use all that I learned in any of my former workplaces, so I’m excited to have more of a voice in Milk Not Jails’ short- and long-term business planning. Q: How did your time in prison shape who you are today. A: To be honest, I’m not quite sure. I’ve repressed a lot of my experience there. I was upstate in prison for about two and a half years. I think the prison was somewhere near Albany. It was not a good time for me, and it’s hard to be out and see so much substance abuse and homelessness that is responded to by the system with jail time. Q: After you got out of prison you became a substance abuse counselor. What caused you to pursue that work? A: Several years ago a cousin of mine, who had been a football player and been in the military, died on the streets. No one would touch him. I held him in my arms. He had been suffering from a drug problem and wasted away to nothing. I wanted to be part of the solution, not part of the problem. Q: What are you most looking forward to at Milk Not Jails? A: I’m looking to be part of the solution here too. I want to grow this company into one that trains good people to have good jobs, gives people second chances and has a bigger impact on the systems that have such a stranglehold on our community. Ever find that you have too much milk left in the fridge when you’re bringing home this week’s CSA share? Or did you run out of granola earlier this week and have a half gallon of milk just sitting there? Don’t dump that milk! Use it explore the world of fresh cheese making! Its an amazing scientific and culinary journey for people of all ages! We’ve experimented with this recipe a couple of times, using whole and low-fat milk and also leaving out the heavy cream (because we just didn’t have any). We also made it with fresh and bottled lemon juice. The recipe seemed to be relatively the same each time; in fact, one of our tasters said the low-fat milk ricotta tasted richer than the one with whole milk and cream. This homemade ricotta has a more delicate flavor and a drier curd compared to store-bought ricotta. You may want to add some spices or extra salt to your finished product. Or serve it on crostini topped with honey and cinnamon for a dessert treat! 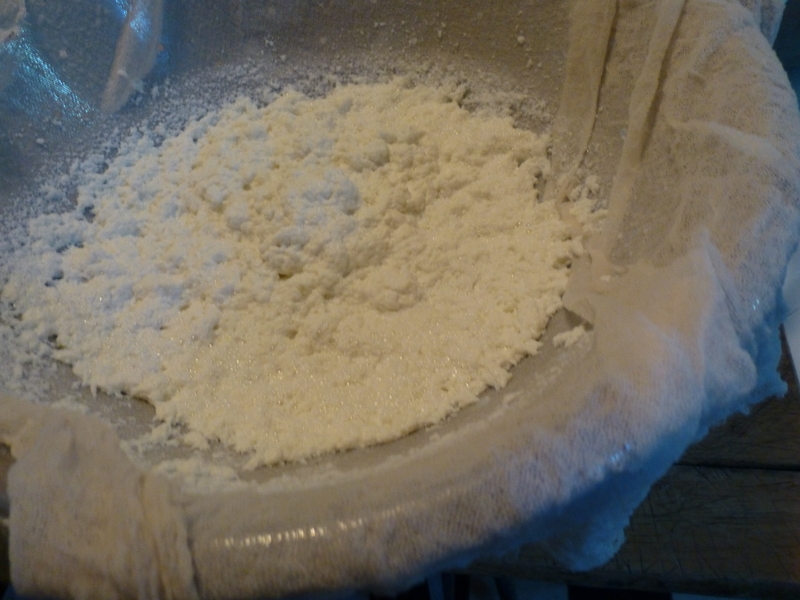 The ricotta draining right after its boiled and curdled. The final product! We mixed in fresh, chopped basil leaves and red pepper flakes to make a spread! moderate heat, stirring occasionally to prevent scorching. Add lemon juice, then reduce heat to low and simmer, stirring constantly, until the mixture curdles, about 2 minutes. Pour the mixture into the lined sieve and let it drain 1 hour. 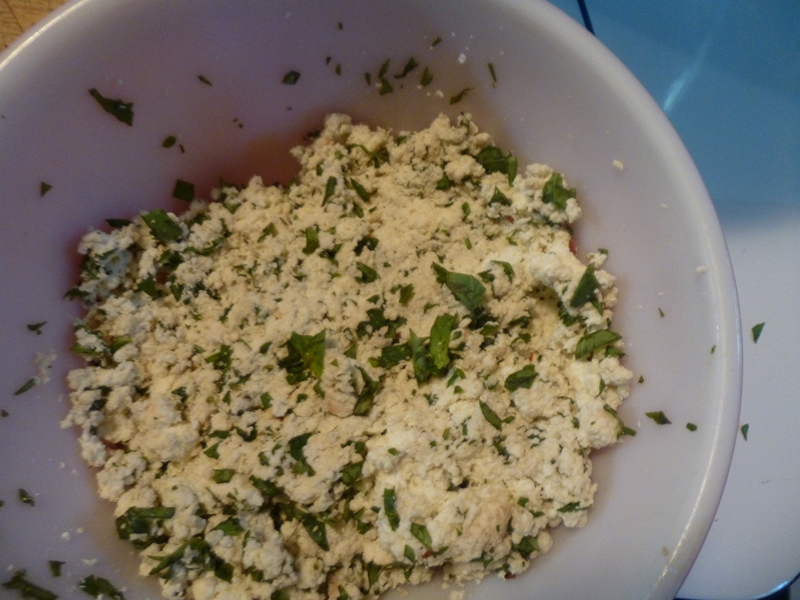 After discarding the liquid, chill the ricotta, covered. Optional: mix in fresh herbs, extra salt or other spices to taste. it will keep in the refrigerator 2 days. Do you know where your milk comes from? Even though New York State is the fourth largest dairy producing state in the country, much of the milk on our grocery store shelves comes to us via a Texas-based multinational corporation called Dean Foods. Dean Foods is driving down the price farmers receive to care for and milk their cows, but this growing season you can purchase milk directly from family farms in the Catskills and Hudson Valley at your neighborhood Community Supported Agriculture (CSA) in New York City. Milk Not Jails is back with dairy shares at NYC CSAs this year. This year we have full- and half-shares available to accommodate all household sizes. The deadline to buy your share is fast approaching, so order online today! We’ve added some new farms that we’re excited to tell you about. 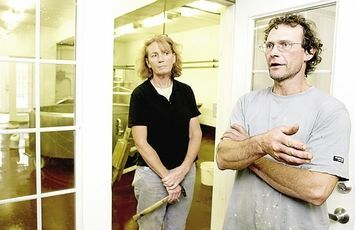 Tim and Mary Tonjes talk about making cheese in the cave on his dairy farm in Callicoon. Tim Tonjes milks his cows in Sullivan County, New York’s poorest upstate county. He inherited the business from his father, who commercially milked their herd for major distributors. But Tim didn’t like thinking of the beautiful Holstein cows on his farm as machines, and he has spent the past ten years returning the farm to sustainable practices. He will be providing fresh, low-pasteurized and non-homogenized whole milk to our CSA. Its single-source, meaning it doesn’t come from anywhere but his cows, who are raised from birth on his farm, never given BST growth hormone and turned out on pasture and fed forage from the farm all year long. Order your milk share from Tonjes Dairy here! 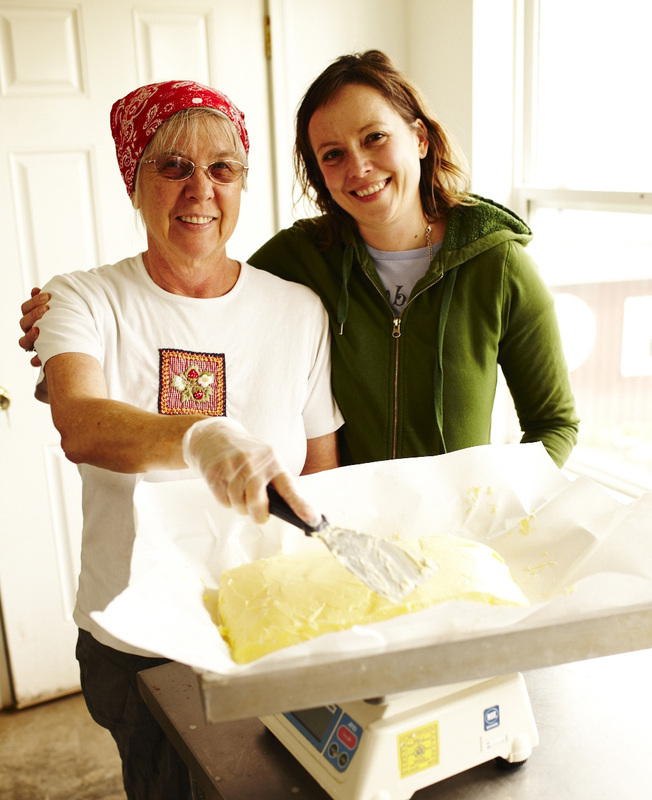 Shannon Mason and her mother, Gail Danforth, make butter inspired by their great-grandmother Martha, who won a butter award at the 1893 Chicago World’s Fair. Shannon and her husband Hamilton Mason are also returning their family farm, Danforth Jersey Farm, to its legacy, inspired by Shannon’s great-grandmother’s butter award from the 1893 Chicago World’s Fair that still hang in their farmhouse kitchen in Schoharie County. A 7th generation farm, Shannon’s parents and children help her tend to their herd of Jersey cows and produce butter in their on-farm processing plant, Cowbella Creamery. Their 30 Jersey cows produce a richer milk than Holstein cows and give their single, source small-batch butter a bright shade of yellow. Order yogurt and butter shares here! Dairy shares also include products from Hawthorne Valley Farm and Ronnybrook Farm Dairy. Read more about the Milk Not Jails farms. Pick and choose what fresh, local dairy products you want to pick-up this season at the CSA by ordering your share today! Milk Not Jails is seeking 2 summer interns to join our statewide advocacy campaign dedicated to moving New York State’s economy towards agriculture and away from prisons. Summer interns will help organize fun, engaging outreach to rural and urban communities at summer parades, fairs and block parties. They will also assist with policy research, develop a Milk Not Jails toolkit for student and community groups, and support the operations of our exciting political line of dairy products! Interns will have the opportunity to support a variety of projects as well as identify one or more projects to dig more deeply into. Milk Not Jails is a political campaign to advocate for criminal justice and agricultural policy reform that will bring positive economic growth. It is also consumer campaign to mobilize New York residents to support the dairy industry and the long-term sustainability of the rural economy. Milk Not Jailsinsists that bad criminal justice policy should not be the primary economic development plan for rural, upstate New York. Candidates must be proactive, very well organized, detail-oriented, and capable of multi-tasking. They must possess enthusiasm about the campaign, experience with Microsoft Office (Word, Excel, Access), comfort conducting street outreach, and excellent writing skills. Familiarity with WordPress is a plus. Conduct research on the dairy industry and reach out to local dairy farmers. Research and prepare briefings on a variety of issues. Draft content for our website and email updates. Organize events throughout New York City, upstate and western New York. Promote the campaign through street outreach and online social networking sites. Assist with steering committee development and communication. Database management and administrative work. The summer internship program will run for 10-12 weeks. Interns must be available 12-20 hours per week with availability on weekends and evenings as needed. This is an unpaid internship. We are happy to work with students to obtain credit towards coursework. Interns that are interested in working 30-40 hours per week are eligible for free housing in New York City for the duration of the internship. Interested candidates should send a cover letter explaining interest and availability (days and times) for the position along with a resume and short writing sample (1-3 pages) to milknotjails@gmail.com. A video still from On3’s TV segment about us. Our mission to end mass incarceration in New York is getting press attention from different continents. German television station On-3 produced a five minute segment about our work. Most of the video is interviews with our founder, Lauren, and our driver, Kevin so it’s understandable to a non-German-speaking audience. Click on over!